Situated near the airport, this hotel is within a 15-minute walk of Ceduna Golf Course, Murat Bay, and Ceduna National Trust Museum. Which hotels are closest to the Ceduna airport? Where to stay near top Ceduna attractions? What kind of hotels are in Ceduna? Which hotel chains are in Ceduna? Travelers to Ceduna will find plenty to explore and enjoy. This city attracts tourists with its culturally-rich ambiance. A couple of favorite places to visit are Ceduna Golf Course and Ceduna National Trust Museum. As you plan your holiday getaway, you'll find 5 hotels and other lodging accommodations to pick from in Ceduna. Ceduna Foreshore Hotel Motel - With a stay at this 3.5-star motel, guests have access to a restaurant and free parking, along with WiFi. Expedia travelers love its clean rooms and location. Highway One Ceduna - With a stay at this 3.5-star motel, guests have access to free parking and an arcade/game room, along with free WiFi. 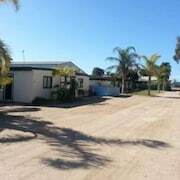 Ceduna Motor Inn - This 3.5-star hotel features a restaurant, free WiFi, and free parking. Visitors like its helpful staff and comfy beds. Ceduna has transportation options to help you easily get around. If you want to venture outside of the area, take a train from Moule Station. The untamed wilderness of South Australia’s western seaboard delivers unmatched beauty and arguably some of the best photo ops in the country. The waters off Eyre Peninsula are home to whales, sea lions, and even sharks, and as you head west along the coast, you’ll find even more secluded bays and sleepy beach towns. Accommodation in Ceduna, SA, is perfectly situated between vast wilderness (it’s roughly 500 km to the border of Western Australia) and the bustling towns of the peninsula. With world-class fishing and whale watching, and plenty of fun on land as well, you’ll want to stick around for a while. The small-town vibe makes Ceduna the perfect place to get some rest and relaxation. Get the best amenities at one of the resorts, check out the selection of Ceduna accommodation overlooking the bay, or find deals on motels that will please any budget traveller. There’s something for everyone in the gateway to the southern coast. 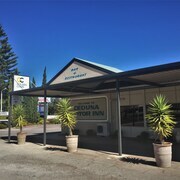 Thanks to Ceduna’s convenient transportation options, it’s easy to get around town, making it an ideal place for both weekend getaways and longer trips. Regional flights from Adelaide land at Ceduna Airport (CED), just 3 km from downtown; there is also bus service from Adelaide. If you want to road trip it, the drive from Adelaide is about 775 km. 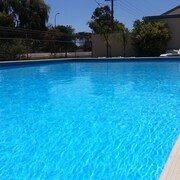 Whatever you envision for your perfect Ceduna holiday, Expedia.com.au has you covered. You won’t pay booking fees, and thanks to Expedia's great prices, you can always reserve with confidence. There’s no time like the present to make your reservations to this getaway destination, so book now and then pack up the kids and the fishing gear to kick start your adventure. Are there hotels in cities near Ceduna? 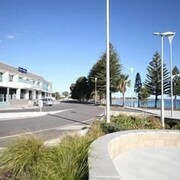 Explore Ceduna with Expedia.com.au’s Travel Guides to find the best flights, cars, holiday packages and more!